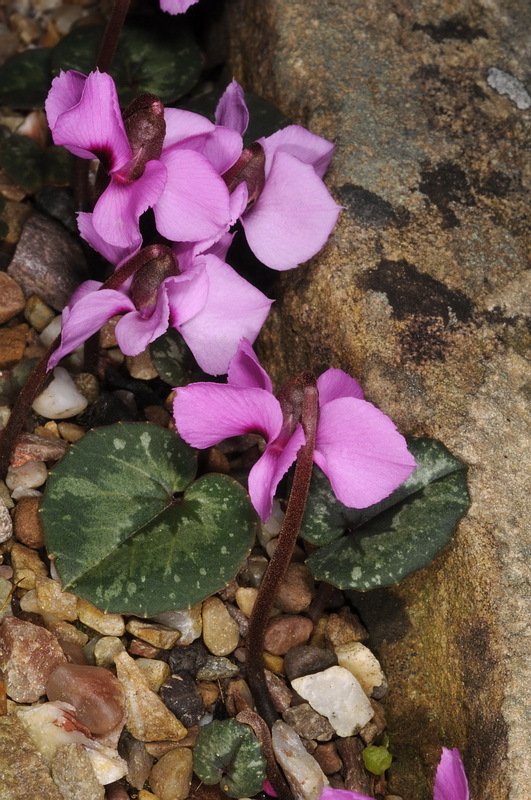 Cyclamen alpinum is a rare south Turkish species. Close to Cyclamen coum. I like all the cilamen species. You captured well this delicate flowers, in their environment. Belle publication valorisant bien le sujet dans son environnement. Beautiful capture of Tis Cyclamen.Colors and composition are wonderful. I really like Cyclamen, interesting beautiful flowers and interesting foliage. A very nice shot, shows the colors and textures very nicely. I wish I could grow them here, tried one that was supposed to be hardy here, but it didn't make it through the first winter, too wet in the winter here possibly. I'll try again, maybe better drainage would work. This looks very similat to the Cyclamen we buy in garden centres here for indoor plants. It is amazing to see Cyclamen in their natural environment.I would have guessed that they lived in forests,but I would be wrong. I didn't expect to see them growing on rocks like this.